GearBuyer has the largest selection of women's down jackets from The North Face, Burton, Patagonia, Columbia, Arc'Teryx, Marmot, Mountain Hardwear, Spyder and more. 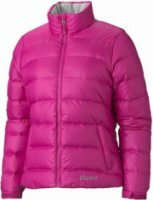 Marmot Slingshot Down Jacket - Marmot Slingshot Down Jacket - Women's: You woke up and saw 15 new on the porch, started gearing up with your cup of coffee and the ski report on the local news and realized, "Yes!, I have the perfect Marmot Down Jacket for today." It's not until lunch that you've been skiing untouched champagne powder all morning and you're still dry and as cozy as ever. the Slingshot Down Jacket is a two-layer MemBrain® waterproof, breathable fabric and 650 fill goose down deliverying warmth, protection, and comfort for extended stays in the white room. 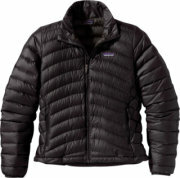 Patagonia Ultralight Down Jacket - Patagonia Women's Ultralight Down Jacket. The Ultralight Down Jacket is our lightest-weight insulating full-zip down layer, with a slim silhouette for thermal efficiency, a superlight 100% nylon shell and a DelugeDWR (durable water repellent) finish. As minimal as an eight-piece rack on an alpine ridge, our new Ultralight Down Jacket supports ascent without excess. It features top-notch 800-fill-power premium European goose down and an updated, ultralight yet super tough shell fabric that blocks wind and sheds snow with its a DelugeDWR (durable water repellent) finish. 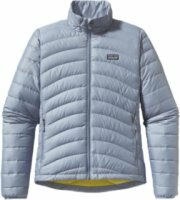 Salomon Pic Down Jacket - Salomon Pic Down Jacket - Women's: With a structured face fabric, down insulation, soft lining and cool lines, the Pic jacket is ready to go from slopes to the city..
Patagonia Primo Down Jacket - Patagonia Women's Primo Down Jacket. Lighter, warmer, softer, and with a new articulated fit, the Primo Down Jacket features 2-layer GORE-TEX® fabric and 800-fill-power down insulation to keep you warm in the harshest elements, from first chair to stormy laps in the trees. When an arctic front hits the night before the bird spins or a chilly dawn patrol up Jackson’s Glory Bowl, the Primo Down keeps you stoked with all-day warmth and unbeatable weather protection. The North Face Destiny Down Jacket - The North Face Women's Destiny Down Jacket is an excellent insulating layer stuffed with high-loft 550 fill down. I'm talking goose feathers, so you know it's good. The goose is a thriving bird. If this jacket was stuffed with dodo feathers then I would be somewhat skeptical.... but sort of impressed. The down is kept dry with a waterproof HyVent 2L exterior. An elasticized powder skirt will keep the snow from getting to you, and a convenient wrist accessory pocket will make sure that a goggle cloth is always at hand. The North Face Greta Down Jacket - FEATURES of the The North Face Women's Greta Down Jacket. 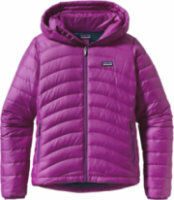 SPECIFCIATIONS of the The North Face Women's Greta Down Jacket. Relaxed fitWater resistant, breathableAdjustable, removable hoodTwo-snap, snap-down powder skirt with gripper elasticPolyurethane (PU) zip chest pocketInternal media-security pocketWrist accessory pocket with goggles cloth. Marmot Mountain Down Jacket - The Marmot Women's Mountain Down Jacket keeps you on top of peaks despite the conditions you face. A Marmot MemBrain makes the fabric completely waterproof so you stay dry when unexpected rain or snow falls on your alpine ascent or black-diamond descent. The nylon fabric is durable and lightweight so you stay comfortable in this long-lasting down jacket. Marmot stuffed its Mountain with 650-fill down insulation to warm you to the core when the temperatures drop. Spyder Raven Down Jacket - Spyder Raven Down Jacket - Women's: The Raven Spyder ski jacket will feel light as a feather with super warm 600 fill down. Spyder clothing combines a custom satin lining with head-turning geometric baffling to woo you, and a two way front zipper and invisible zippered hand warmer pockets to meet your many winter needs. The Raven will be the perfect Spyder jacket to add to your winter wardrobe..
Burton Sage Down Jacket - Burton Sage Down Jacket - Women's 2012: No question a 650-fill puffy brings the heat, but the women’s Burton Sage Down Jacket offers quick venting and a buttery soft, breathable lining, making it a jacket you can throw over a light layer all season. At the request of Burton’s riders, the super warm down insulation has been engineered to be thinner and less bulky in key areas, including the hood, collar, and cuffs for a down jacket that strategically heats without smothering mobility. Patagonia Down With It Vest - The Patagonia Women’s Down With It Vest is a down filled vest for keeping warm during the winter chill. The Down With It Vest is packed with 600 fill down to keep you core warm. The outer shell is 100% recycled polyester coated with a durable water repellent, to keep the snow flurries for soaking in. The hood is lined with a cushy deep-pile fleece to warm your ears, but feel free to take it off if you’re not feeling like a hood, it’s completely removable. 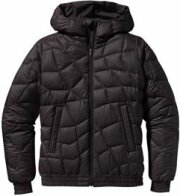 Patagonia Aliso Down Jacket - Keep warm for the early-morning scooter commute. The Patagonia Women's Aliso Down Jacket has an asymmetrical quilting pattern that updates its traditional bomber-jacket styling and also keeps the 600-fill goose down in place. A sleek polyester ripstop shell (100% recycled) with a Deluge® DWR (durable water repellent) finish sheds moisture, and the wind-flapped front zipper blocks cold gusts. Gathered ribbing at cuffs and hem also help seal in heat. Essentials stay secure in the internal zippered pocket. Obermeyer Kassidy Down Jacket - Obermeyer Kassidy Down Jacket - Women's: Obermeyer’s Kassidy Down Jacket takes a classic and makes it current. With a water resistant, shiny outer nano-twill fabric and down filling, you won’t only look great, but you’ll feel great wearing it. Layer it under a shell for those super cold days on the slopes, or alone for those super cool nights on the town. Shaped seams for fitQuilted satin liningEngineered quiltingDuroGuard DWR keeps water off fabric surface and resists liquid stainsFull-motion, articulated sleeve constructionTricot-lined hand pocketDown fillInternal zipper windguardFull-zip for easy on/offLight and compressible for comfortSki pass D-ringShaped cuffs. Bogner Sale Down Jacket - Bogner Sale Down Jacket - Women's: The Sale Down is an updated version of one of Bogner's most popular models. It now comes in a shimmery nylon taffeta fabric with a removable Asiatic Raccoon fur trim. 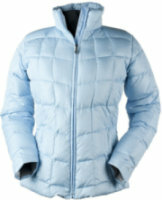 The Fire + Ice down jacket is cozy thanks to the down insulation yet still very figure-flattering. Vary your look with the option to wear it with or without the hood. 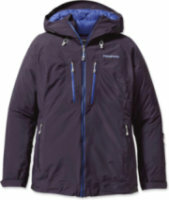 Bogner Fire + Ice Down Jacket Sale-D measures at 63 cm. Spyder Breakout Down Jacket - Time to get out of the army-green rut you've been in ever since seeing Platoon. The Spyder Women's Breakout Down Jacket will help you kick your color-codependency this winter. Pull on your snowshoes for a post-holiday stomp, sneak out for a dawn patrol on Thanskgiving morning, or hit that 75-day mark on the hill in this warm down jacket. Despite the name, the Breakout bears a clean profile, not an unsightly bump in sight. 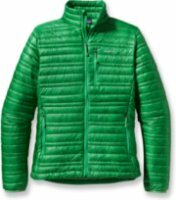 Patagonia Down Sweater Jacket - The Patagonia Down Sweater is way to stay toasty warm, comfortable and protected by those chilly winds. Whether you're using it to head out and run errands or donning it as a midlayer when you hit the slopes on a cold ski day, the Down Sweater is the way to go. It's a highly compressible insulation meaning you'll still have plenty of mobility when you're outdoors working up a sweat. Spyder Timeless Down Vest - Haute sport fashion and a high collar highlight the Timeless Down Vest, which is warm right to the core thanks to its 700-fill down insulation. New custom zipper collection. Brushed microfiber inner chinguard. Zippered hand pockets. Pop branding elements. Machine wash cold, tumble dry low. Imported. Polyester Downproof DobbyDrawcord Adjustable HemBrushed Microfiber Inner Chinguard.